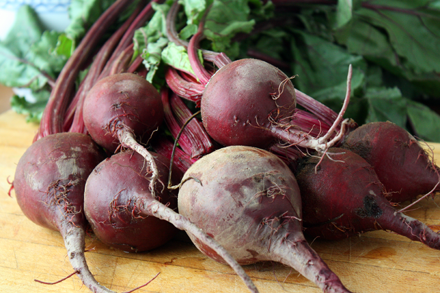 Beets were introduced into China from Babylonia around the ninth century. However unlike other food items of New World origin such as potatoes, tomatoes, peanuts and chilies, which Portuguese traders brought to China in the seventeenth century, beets have never become a major Chinese cooking ingredient. Given this long history of existence in China why are they not more popular? Perhaps it’s the stringent growing conditions that limit their availability. Beet plants grow best under moderate cool climate. Therefore areas of beet production in China are limited to the Northern region, and some highland areas in the South. Or perhaps, as many of my Chinese and American friends insist, beets are just simply unpalatable! 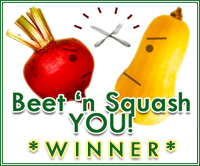 Personally I don’t subscribe to this theory so when Mel from Bouchon for Two (Now Gourmet Fury) invited me to submit a recipe for their November challenge of Beet ‘n Squash YOU! I accepted it to prove this theory wrong. In Chinese cuisine, beetroots are most commonly used for making soup and their leaves used for making stir-fries. Unfortunately none of these recipes excited me. So instead of recreating a regional beet recipe I opted to look into adapting a recipe that uses another root vegetable. As it happens one of my favorite Northern Chinese snacks is the turnip puff (蘿蔔絲餅), which is made with turnip and pork filling wrapped in a Chinese puff pastry that’s flakey and light. Recently they’ve become commonly available in dimsum restaurants in spite of their Northern origin. I decided that substituting beets for turnips would make an interesting modern twist. The French version of puff pastry is made by folding and rolling a dough, known as détrempe, with butter. The Chinese puff pastry is similar but layered with a lard and flour mixture more like a beurre manié. Although this is not a complex process, home cooks often avoid making puff pastry because it is time consuming. But follow my recipe and you’ll be rewarded with delicious flakey puffs. 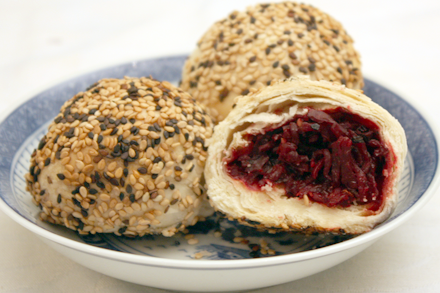 As for the beet filling, it follows the turnip filling recipe very closely. A little bit of pork and dried shrimp is added to enhance the spiciness of the root vegetable. The only difference in taste is that the beet filling has a sweeter, earthier tone. 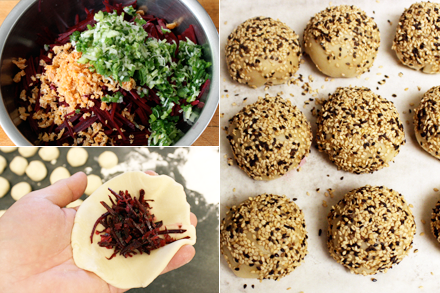 One of the exciting trends in Chinese cooking is the use of non-traditional ingredients while maintaining traditional techniques and flavors. I hope you agree with me that this recipe does that and also presents the oft-neglected beetroots in a new way. To make the lard dough first blend the flour and salt together then cut the lard into the flour mixture. You can either use a pastry cutter or regular knife to cut into the mixture until it forms a course grain texture. Add the water and knead the dough until smooth. Then make the lard cake by combining the flour and lard and mix well. Set both the dough and the cake aside for about 20 minutes. Peel and cut the beets into very thin shreds of about 1/32 inch thick. You can use a course grater instead. Set the beets aside. Rehydrate the dried shrimp by soaking them in warm water for about 15 minutes, and chop them finely. In a wok heat the vegetable oil until it just begins to smoke. Add the ground pork to the wok and stir-fry for about one minute. Drain the pork from the fat and put in a mixing bowl. Add all the other filling ingredients and mix well. Set the filling aside. Divide both the lard dough and lard cake into 32 equal portions and roll them into balls. With a rolling pin flatten the lard into a circle of about 6 inches in diameter and place a lard cake ball in the center. Fold up the lard dough to cover the lard cake completely and roll into a ball. Repeat this for all the portions. With a rolling pin roll the combined pastry dough ball into a long strip about five inches wide and a quarter inch thick. Then roll up the pastry dough strip lengthwise into a spiral. Using a rolling pin once again roll the dough lengthwise into a thin long strip of about 1 inch wide, 6 inches long and quarter inch thick. Finally roll the strip lengthwise into a stout spiral cylinder shape. 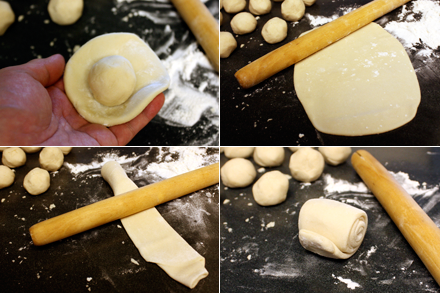 User you hands to roll the dough into a small ball, then use the rolling pin to roll the dough into a small round about 5 inches in diameter. Repeat this for all of the pastry dough portions. Be sure to wrap the pastry dough wrapper in plastic wrap if not used immediately. Dissolve two tablespoons of sugar in one tablespoon of water to make a syrup. Mix the black and white sesame seeds together and spread them in a shallow bowl. Preheat the oven to 375 degrees F before assembling the puffs. Put about 1 tablespoonful of filling in the middle of each dough round. Fold the edges of the dough over the filling and pinch the edges to seal the dough. 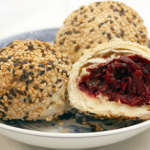 Be sure to seal the opening tightly otherwise it will leak when you bake the puffs. Use your palm to roll the puff into a smooth round ball. 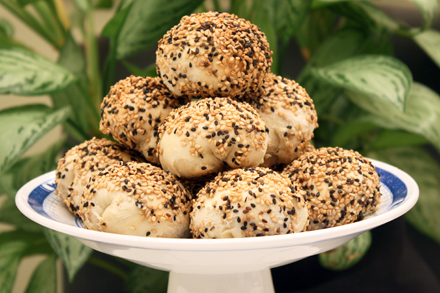 Use a pastry brush to paint a thin layer of sugar syrup around the dough ball and roll the ball in the sesame seeds. Allow the seeds to generously stick to the dough. Arrange the dough balls seam side down on a baking sheet lined with parchment paper. Bake the puffs for about 25 minutes or until the crust is golden brown. Serve the puffs warm as a snack. These look amazing – I love beets! Mei, It was fun trying to come up with an interesting recipe for beets. The puffs actually turned out to be quite delicious. Kian, these look wonderful. Can’t wait to try it out soon. great entry – these look so satisfying! I love beets! The recipe looks simple to do! Thanks! I was wondering what you know about the nutrition of lard and the possibility of substituting for lard in Chinese pastry recipes. I love the flakiness, but I wonder about the fat and cholesterol. But then again, is butter any better? Thanks for your ideas. Anni, Thank you for your comment on “lard.” I’m glad you mentioned it because lard (non-hydrogenated), along with butter, tallow, coconut oil and palm oil, is not as unhealthy as other vegetable oil. Almost all vegetable oil are in fact not very healthy. I continue to suggest vegetable oil in my posts as a generic oil. I do not endorse any specific vegetable oil at this point. Personally I am switching to using coconut oil and lard again for most of my cooking. Oh wow! You are so creative chef Kian! These look wonderful, and I really want to make them, but is there any substitute for lard? Oops please disregard my last comment, I did not see the question and response to the lard question earlier. And thank you for all your thoughtful links and answers I read the great post on the “fitness spotlight” was very insightful. That said, where in NY does one get lard, the good kind that is, non-hydrogenated. I’ve been meaning to make the turnip version of this dish. Can I just substitute 3/4 pound of turnip for the beets in this recipe? Thanks!! Yes, you can just substitute the beet with turnip. But turnip is more moist than beet so you should remove some of the moisture. Sprinkle about 1 teaspoon of salt over the shredded turnip and let it stand for about 15 minutes. Then squeeze as much of the liquid out as possible. Adjust the salt in the recipe since the turnip will already be salted. I’m not a fan of beets, but these sound rather interesting. And I don’t remember ever seeing beets for sale in China, except canned in the foreign aisle of the supermarket. Yes Matt, it is very rare to see beets in China. They are mostly grown for sugar production. But if you’re near region where beets are grown you will find beets used in some of their cooking.